Jan Willis was feeling euphoric. Sitting in the basement of a church in London’s impoverished East End last summer, she looked around and realized that of the 40-odd people in the room, 31 were black. For Willis and the handful of African-American Buddhist teachers now beginning to speak out, Buddhism in America has been a homogeneous world inhabited largely by upper-middle-class whites. For Willis, Steele and Jarman, their journeys as Buddhists have been part of a larger journey of emerging from the shadows of racial prejudice. They continue to deal with it, subtly and not so subtly, both in the greater society and within the American Buddhist world. The world that Jan Willis experienced as a barefoot little girl playing in the dusty alleys of an Alabama mining camp in the mid-1950’s was carefully divided into black and white. The border lay just a few blocks from where she lived, where the white cottages began. Forbidden territory. Stronghold of the Ku Klux Klan. The Klan’s shadow lay heavy over the hamlet where Willis was born and raised, a tangible presence even to a little girl. She saw firsthand the beatings and other punishments meted out to blacks who stepped out of line-those who committed transgressions like accidentally stepping on white-owned property while walking to school or the grocery store, with its “white” and “colored” water fountains. If she had any doubts about her place in the world, they were consumed in the flames of the cross the Klan ignited on her front lawn one terrifying night, as Willis, her sister and her mother cowered in their home waiting to die. In her search for healing, she would march with Martin Luther King Jr. in Birmingham, take part in the armed takeover of the Cornell student union building by militant blacks, and ultimately find her way to the hut of a gentle Tibetan monk in the hills outside Kathmandu. From a Buddhist perspective, it would be said that a combination of karma and auspicious coincidence brought Willis to the doorstep of Lama Yeshe Thubten, the teacher who would become her root guru. However, for most African-Americans, she believes, lack of money keeps the door to the dharma firmly shut. “There are far too few people of color in Buddhist centers and retreats, in part because of the nature of where the retreats are and the fact that they cost money,” says Willis, now one of the nation’s leading Buddhist academics. “It’s about class. Working class people can’t take a month off to go on retreat. “Buddhism is a commodity like everything else in the States,” the Wesleyan University professor of religion adds. “Trungpa Rinpoche talked about ‘spiritual materialism.’ You can choose among hundreds of different traditions and lineages in the spiritual supermarket, and then you pay. “That’s part of why Soka Gakkai has had success,” she says of the Japanese Pure Land organization, which counts many blacks among its members. “They’re in the cities, they’ve tried so hard to bend over backwards to assimilate with American holidays and they have a simple ritual.” The same, Willis continues, is true of the Friends of the Western Buddhist Order, the group she met with in Britain. But in the American sanghas of the more traditional Buddhist lineages, blacks are largely absent. Ralph Steele has also begun to tackle prejudice and exclusion within the sangha. Spirituality runs in Ralph Steele’s blood. The grandson of a minister, Steele’s family has run a church for the past 150 years. A devout Christian upbringing is one of the things that Steele shares with Willis and Jarman—and the vast majority of African-Americans. He also shares with them the experience of living as an outsider. Steele grew up on Pawleys Island, a then-isolated speck of land off the South Carolina coast populated by freed slaves from Sierra Leone. Steele grew up speaking Gullah, a Creole language formed from Elizabethan English and African dialects. He was 12 years old before he spoke English. An Army brat, Steele’s first exposure to the dharma came during his high school years in Japan, when he began to study martial arts. He remembers the day his instructor leaped up and kicked the rim of a basketball hoop. Like so many Vietnam veterans, Steele was nearly destroyed by the war. Along with physical and psychic scars, Steele brought home an addiction to heroin and a five-pack-a-day cigarette habit. He credits devotion to his martial arts teacher and to the discipline of martial arts practice with getting him through. “It wasn’t the martial arts itself,” he says. “It was the teacher, the trust in the teacher.” Back in the States, Steele enrolled at the University of California at Santa Cruz and signed up for a course on Buddhism—taught by a young black professor named Jan Willis. “I was pretty tough on him,” Willis reports without elaboration. A month after that enigmatic encounter, Jarman, a fifth-degree black belt Aikido master, was invited to a karate demonstration at a nearby Buddhist temple. “And who is there, but this guy. After that, I began to go there once a week.” The teachings, Jarman says, helped him to transform his image of himself and move beyond the anger and suffering to which he had clung since Southeast Asia. He would go on to become a successful jazz musician, retiring in 1993 from the renowned Art Ensemble of Chicago. 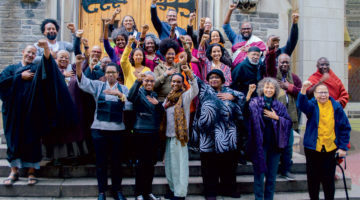 In spite of the marginalization of blacks in the American sangha, Willis believes that Buddhism can offer the kinds of transformation that she—and Steele and Jarman—have experienced to other African-Americans. Willis calls herself a “Baptist Buddhist.” Growing up in the revival meeting tents of the Old South, she watched in awe as friends and relatives were swept up in spiritual frenzy. 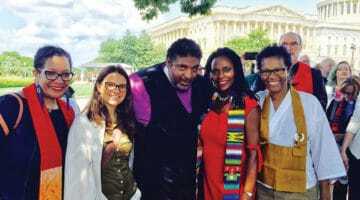 “Quite simply,” she wrote in Dreaming Me, “nothing scared me more than black women engaged, as good feeling Christians, in the activity known as ‘shouting. '” But it was in just such a setting that the diminutive 14 year old “found Jesus” and was baptized in a water tank out behind the church. On that day, Willis first felt herself engulfed in spiritual love as friends and family reached out to welcome her into the bosom of the church. Years later, meditating on a Himalayan mountain, she would again touch that equanimity and recognize the common roots of love and compassion that link the Christianity into which she was born and the Buddhism she had embraced. Still, it was with some trepidation that she returned to Alabama with her new-found beliefs, only to find her conviction that Buddhist meditation had much to offer African-Americans confirmed by none other than the pastor of the church where her father served as deacon. “We Baptists could use some of these methods,” she recalls him declaring. “It’s one thing to say, ‘Love thy neighbor.’ It’s a whole ‘nother thing to do it.” That, she says, holds true even for Buddhists: “I can’t even love myself! So we’re talking about transforming prejudices about others and about ourselves.” Willis and colleague Marlise Bosch, a women’s counselor in the Netherlands, are currently at work on a booklet containing a series of visualizations and exercises designed to help American Buddhists confront—and go beyond—their innate prejudices. In her early days in India, several lamas told Willis that she had been Tibetan in a past life. The patch of white in her hair, she was told, was a mark Tibet’s dharma king, Trisong Detsen, conferred on those who had helped construct the great monastery at Samten. If that were true, she wondered, why was she reborn in the body of an African-American woman? Willis now thinks she has the answer. Earlier this year, Joseph Jarman sat in meditation beneath the Bodhi Tree, the site of the Buddha’s enlightenment. It had been more than 40 years since he had first been exposed to the basic ideas of Buddhism. Now he was deep in a spiritual experience that he would forever treasure. “I felt like I was floating,” he recalls. “Even though I have meditated for 30 years, I never had that feeling. The energy was just like a barrel of water being poured down on you. It’s the most positive energy I have ever felt.” But there was something else about his visit to Bodhgaya that deeply struck the 63-year-old Chicago native: it was the energy of equality. “We are all prejudiced,” agrees Jan Willis. “We are all forming these judgments. 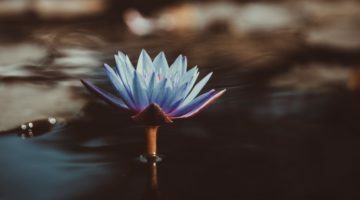 In Buddhist psychology we know about this, so let’s do what we do best at Buddhist centers: let’s do some of these meditations that are specifically geared toward helping us recognize—become mindful of—prejudices and transform them. I want us to feel comfortable in our own skin. I think that’s a starting place. Then we can see we’re all human beings, and then maybe we can stand in each other’s shoes,” she says. The irony that practitioners who are striving to see beyond dualism find themselves viewing their own sangha in terms of black and white is not lost on the trio. Willis argues that communicating the practice in a digestible form is only part of making it accessible to African-Americans and other people of color. “One part of accessibility is making it comprehensible. One part is making it affordable. One part is making the centers in places where people can get to them. One is developing things that don’t require a month-long retreat. Lawrence Pintak is a freelance writer living in Princeton, Massachusetts.